Pmod CMPS2 3-axis digital magnetometer/compass. In two previous posts we discussed how to calibrate magnetometer data in order to get accurate measurements, as well as how to acquire data in the first place. In this post we will go through the last major step, how to convert the data from units of Gauss into a true compass heading using the Pmod CMPS2 as an example. 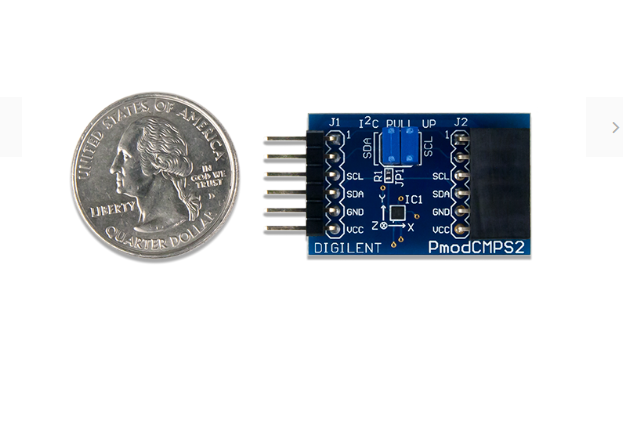 The Memsic MMC34160PJ magnetometer on the Pmod CMPS2 provides data for each axis in units of Gauss, but the information is generally more legible when presented as a compass heading. The method for converting Gauss units to a compass heading is provided below. If you’d like to see how to acquire date initially or how to calibrate your magnetometer, you can visit the previous posts on theses topics, or go to the Pmod CMPS2 reference manual. 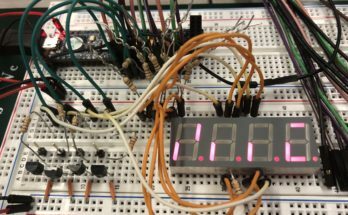 If you’d like to see some example code written in the Arduino IDE for how we acquire, calibrate and convert data from the Pmod CMPS2, see the Pmod CMPS2 Resource Center. For questions or comments, please post in the comment section below or visit the Digilent Forum! I used your code and it work at a certain point but there is a lack of data between 90 and 270. It switches from those two if the D data tries to goes in between those two numbers. Maybe you have an explanation to my problem! I would recommend posting your question on the Digilent Forum (link at the top of this page since it doesn’t look like I can provide a url link) where one of the Digilent engineers will be able to see and respond to your question in an environment much better suited to troubleshooting.